Three Bean Enchilada Chili - three times the flavor plus a secret ingredient that makes this a favorite restaurant recipe! 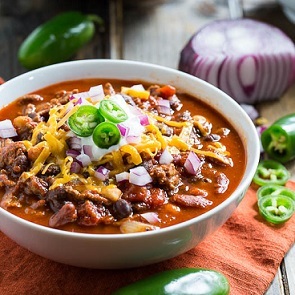 This restaurant chili recipe is a secret restaurant recipe because it specifically calls for Ancho chili powder, and it does make a difference. This recipe uses a favorite restaurant enchilada sauce . The Ancho is a dried Poblano chili which is then ground into powder. Ancho chilies have a mild, fruity and slightly sweet taste. They start out as fresh green Poblano chilies and after being ripened to red and then dried, they become shriveled, smoky and dark brown in color. Left to dry, the chilies can be crushed and made into spice powder or used to season chili and other Mexican dishes such as mole and tacos. The restaurant customers were pleased. 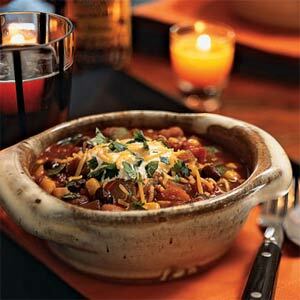 It is now a favorite restaurant chili recipe. Preparation time: 30 minutes for preparing the sauce. Serves 6-8. Serve with cornbread or warm tortillas and enjoy! Enjoy your Three Bean Enchilada Chili made with this delicious enchilada sauce and the company of those you share it with! "A mystery: why is chili called chili when it is really hot?"